If you’ve ever been on vacation – gee I sure HOPE you have! – than you KNOW it can be a real B!+(# to get back on track! Vacations are SO fun! There’s eating out and drinks, late nights and snacks, treats and ignored workouts! And then…you come home…. Scale? What scale? I don’t see a scale! Please don’t make me stand on that scale! That’s when reality hits, and regret follows: WHY did I do it?! WHY WHY WHY!!!??? Nothing a little hard work and dedication can’t fix! 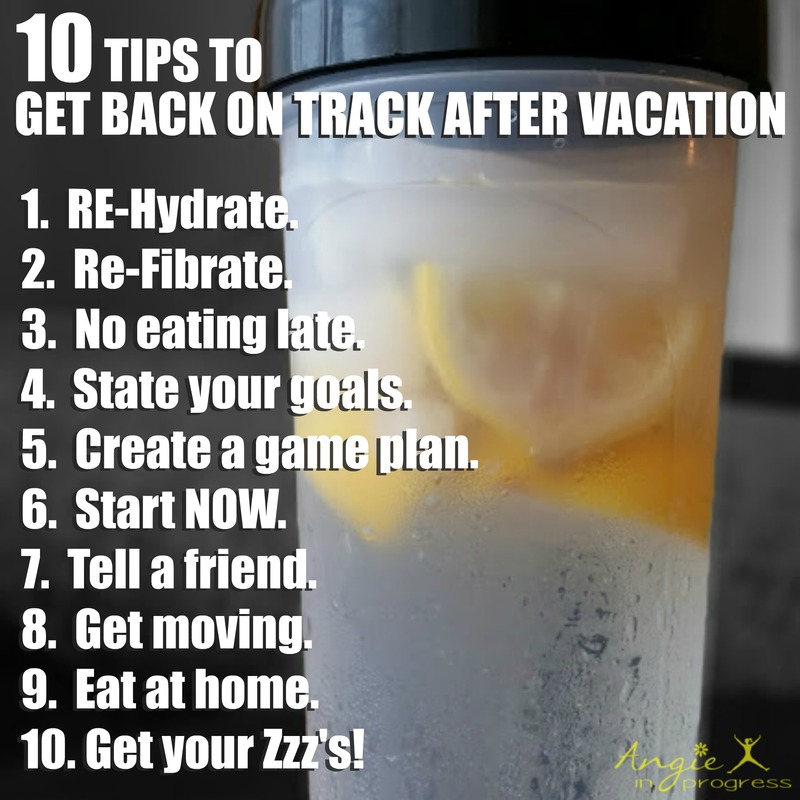 Here are my top 10 tips for getting back on track after a vacation! 1. Re-hydrate! Drink half your body weight in ounces of water per day to help flush those toxins from all that fun OUT of your body! Add some cut-up fruit for flavor (lemons, limes, berries, etc…). You’ll feel less bloated and better each day! 2. Re-fibrate! Eat lots of plant-foods plus oats, chia, flax, seeds and beans to clean out your insides and move the junk OUT of your body! 3. No eating late! Close the kitchen early and give your body time to digest before you lay down to sleep. You’ll sleep better and feel better in the morning. 4. State your goals. If you’ve fallen off track and want to get back on, sit down with pen and paper and remind yourself WHY it’s important for you to re-commit and get to work. Then it’s REAL! 5. Create a game plan. HOW are you going to reach those goals? Schedule your workouts, create a meal plan and shopping list and stick to it! 6. Start NOW! What are you waiting for? Don’t put off your goals for one more second. Every little step forward gets you closer to where you want to be. 7. Tell a friend. Maybe they’ll want to join you, but at the very least you’re holding yourself more accountable to your goals when you tell someone what you’re up to. 8. Get moving! Lace up and get sweaty! You will always feel better when you get in a good workout each day. You are more likely to stick to your nutritional goals when you’ve worked out early in the day. Who wants to sabotage that early morning workout?! 9. Eat at home. You can control what you eat when you prepare your foods at home. On vacation we eat out and consume a lot more fats and sodium than we would typically eat at home. Take a break from eating out and feed yourself clean, whole foods. 10. Get your Zzzz’s! I struggle to sleep in a bed other than my own, so when I get home from vacation, I always feel like I need a vacation! Does that make sense? Sleep a little extra to help your body recover from lost hours of sleep while you were away. I’ll be tackling almost every one of these with the 3 Day Refresh! I’ve done it before with GREAT results, so I’m doing it again. And the best part is that I won’t be starving myself – unlike some other detox/cleanse type programs. *Now, of course you cannot lose 4 pounds of body fat in 3 days, BUT you can shed excess fluid and CRAP (literally!) that your body is holding on to from feeding it ‘not so nice’ foods! It was a great re-boot! And it’s a fantastic way to get back on track after vacations and/or holidays! UPDATE! Here are my NEW results!!! LOL! Exact same as last time! 4 pounds and 1.5 inches! To save some money when you bundle the 3 Day Refresh together with Shakeology, and/or another fitness program, click on the pictures below!